Beans vs. Cornbread » They call me Mr. Do! They call me Mr. Do! As much as I’ve tried to avoid talking about it, I haven’t been feeling well for a bit. Seems mostly sinus-related among other things. Even after deciding to stay home this weekend to get some rest, I still feel kinda off. The lack of energy is what’s been killing my artwork, so I decided to ease back into my happy place of childhood memories. It is there that I discovered the perfect subject: Mr. Do. Mr. Do! is a 1982 arcade game by a now defunct (I guess) company named Universal (no connection to Universal Pictures). Since it’s from the early 80’s and doesn’t involve outer space, it sounds insane if you ever try to explain it to someone. Think I’m jokin’? Fine. Here’s the short version of it: Mr. Do! 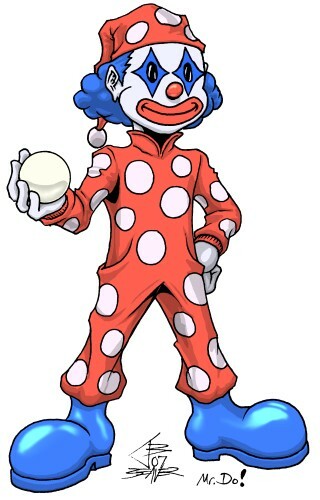 is about a clown who picks cherries while using apples and his magic ball to battle dinosaurs, ghosts and the alphabet. There. Happy now? You’ve gone and made me explain a crazy 1980’s video game. Then again, that’s why old video games were so much fun. Keep your bald, faux-tribal inked steroid anti-heroes and government special-ops face-stabbers who like to run around jagged rubble and rusty, metal factories. Me, I miss the crazy. Chances are, I’ll be drawing a few more video game characters that are from the real old-school. I already have a few in mind.